International peace talks on Syria involving the United States, Russia, Turkey and other regional players have ended in the Swiss city of Lausanne Saturday as all parties agreed to continue contacts in the near future. The meeting concluded without any apparent plans for a news conference, a joint statement or anything else that might signify a success. Foreign Minister Mevlüt Çavuşoğlu said due to the meeting's 'informal nature', no consensus over a new ceasefire deal has been reached but all countries agreed on the fact that Syria needed a political solution. Speaking to reporters following the meeting, Çavuşoğlu said Al-Nusra Front must withdraw from military posts in Aleppo immediately for humanitarian aid to reach the city safely, adding that the Syrian opposition forces should separate itself from the terrorist group. He said that he extended Turkey's concern over the delivery of humanitarian aid and the dire need of a ceasefire as the parties in the 4½ hours meeting agreed on 'several issues'. Russian Foreign Minister Sergey Lavrov also made a statement, saying that the participants agreed to remain in contact and hold further meetings as soon as possible. 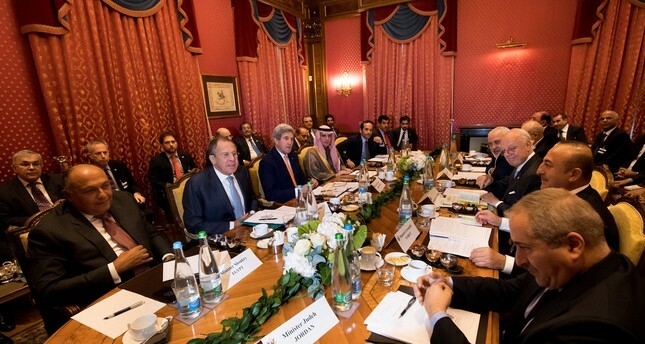 U.S. Secretary of State John Kerry led the renewed talks. He was joined by a familiar cast that included Russian Foreign Minister Sergey Lavrov, Turkish FM Çavuşoğlu and the top envoys from Saudi Arabia, Iran, Qatar, Egypt and Jordan. Days of deadly airstrikes in Aleppo prompted Kerry last month to end bilateral U.S.-Russian engagement on Syria, including discussions over a proposed military alliance against Daish and al-Qaida-linked militants in Syria. Last week he accused Russia of war crimes for targeting hospitals and civilian infrastructure in the Arab country. Nevertheless, Kerry reunited with Lavrov at the lakeside Beau-Rivage Palace in Lausanne, and met with Lavrov before the larger gathering. U.S. hopes of any diplomatic progress appeared to rest squarely on Russia's cooperation. Kerry also met privately with Saudi Foreign Minister Adel al-Jubeir. The conflict has killed as many as a half-million people since 2011, contributed to Europe's worst refugee crisis since World War II, and allowed the Daish to carve out territory for itself and emerge as a global threat. On Saturday, Syrian and Russian airstrikes hit several opposition-held neighborhoods amid clashes on the front lines in Syria's largest city and onetime commercial center, according to the Britain-based Syrian Observatory for Human Rights and the Aleppo Media Center, an activist collective. Also, opposition fighters backed by Turkish airstrikes launched an offensive to try to capture Dabiq from Daish, which confers special status to the northern Syrian town in its ideology and propaganda. In an interview this week with a Russian media outlet, Assad said a military victory in Aleppo would provide the Syrian army a "springboard" for liberating other parts of the country.